I have been on this year-long goal of “purging” our house. My husband often says that a simple house is much easier to clean than a complicated “heavy” house. And our house is heavy. So I have gone through our closet multiple times (we have a very little master closet so it needs to be pretty streamlined), cleaned out both of our linen closets, tons of toys (although not enough! Haha!). And I have gotten a few items out of our kitchen, but it still needs a good going-through. But with a 4 year old and a toddler, going through anything other than diapers and laundry is a pretty tall order. So I’m putting the kitchen on a “diet” too. And I’m systematically going through the kitchen and getting rid of one item a day. 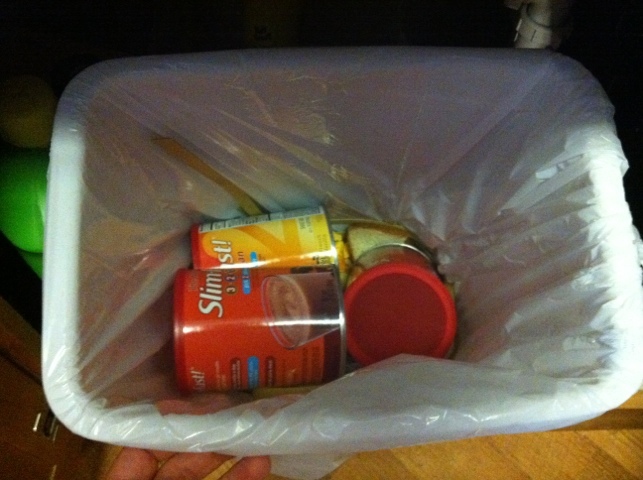 And yesterday was an awesome item to get rid of… the leftovers from my attempt at a Slim Fast diet. Had I thrown these out a few months ago before starting my covenant, I don’t think it would have been as happy of a moment. It was, after all, a failed attempt. And an attempt done in shame as well. I tried to keep it a secret from my husband. I knew he wouldn’t approve and I was ashamed to have had to resort to SlimFast anyway. It was almost like taking a diet pill or something. And I have wanted to lose weight a natural way… a way that would last. I don’t want to just be skinny for a year or so… I want to be free of this addiction for the rest of my life! Anyway, it was so nice to see how God has once again met my needs when the world could not. God chose things the world considers foolish in order to shame those who think they are wise. And he chose things that are powerless in order to shame those who are powerful. God chose things despised by the world, things counted as nothing at all, and used them to bring to nothing what the world considers important. As a result, no one can ever boast in the presence of God.